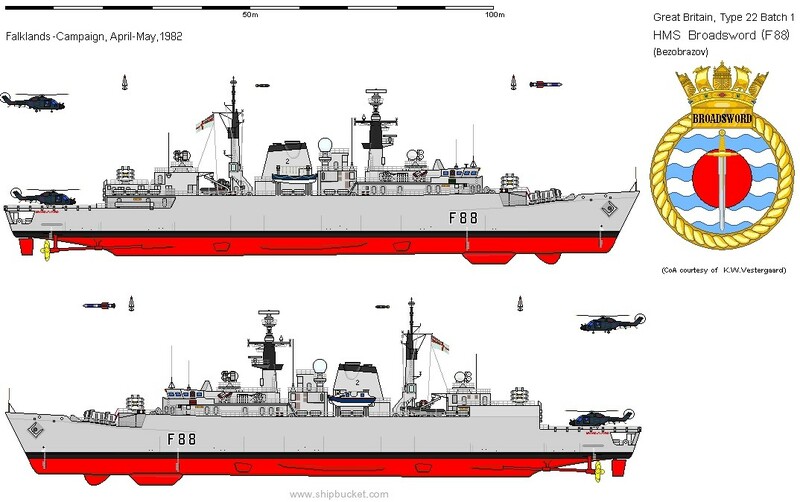 Broadsword was ordered from Yarrow Shipbuilders on 8 February 1974 and was laid down at Yarrow's Scotstoun shipyard on 7 February 1975. She was launched on 12 May 1976 and commissioned on 3 May 1979. While on sea trials, Broadsword was called into service as the command ship during the large rescue operation required after storms struck the 1979 Fastnet race. Broadsword took part in the 1982 Falklands War where, on 25 May 1982, she was providing air defence support to HMS Coventry. A technical fault in her Sea Wolf missile system allowed two Argentine Skyhawks to sink the Coventry. Broadsword was hit by one bomb, which bounced up through the helicopter deck and put out of action a Lynx helicopter, before exiting and exploding harmlessly. She subsequently rescued 170 of the sunken Coventry's crew. She shot down one IAI Dagger of FAA Grupo 6 and shared an A-4C Skyhawk kill with HMS Antelope's Sea Cat, land-based Rapiers and Blowpipe SAMs. In 1993 Broadsword took part in the naval operation in support of Operation Grapple (Yugoslavia), in the Adriatic Sea. Upon completion on 8 July 1993, a fire broke out in the aft auxiliary machinery room. This resulted in the deaths of two on-watch engineers; LMEM(M) Mark Hunt, age 30, and MEM(M) Roy Ware, age 22. She was decommissioned on 31 March 1995 and was sold to the Brazilian Navy on 30 June 1995 and renamed Greenhalgh (F 46).